CK Encounter Fresh is described as an intense, attracting and exciting flavor. 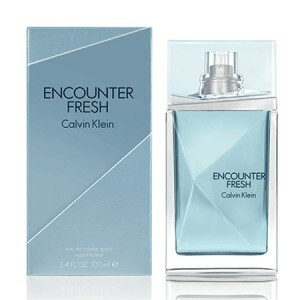 CK Encounter Fresh 100ml. Eau De Toilette is described as an intense, attracting and exciting flavor, reflecting the inner world of a man who skillfully controls its own desires. Encounter Fresh perfume belongs to the family fern woody flavors with a pronounced aromatic content. New starts refreshing mojito accents and invigorating bergamot chords, which are complemented by soothing shades of spicy cardamom and lavender flowers and light alcoholic flavors of rum. Aroma of the final chord of sandalwood, patchouli and green notes Cistus leaves. Exquisite men's fragrance Calvin Klein Encounter Fresh - new summer 2013. Unique wood-fern aroma envelops the initial chords fresh Italian bergamot and mojitos, taking middle notes consisting of cardamom, rum and lavender. Base notes leave a slight aftertaste Cistus leaves, patchouli and sandalwood. Calvin Klein Eau de Toilette Fresh Encounter represents uncompromising masculinity and elegance. Connoisseurs refreshing perfume creations certainly worth to buy this perfume! Encounter Fresh fragrance comes in line perfume Encounter. Compared with the first of its representative, this version has a more cool, crisp sound that emphasized in the title. Initial chord forms spicy-citrus accord of bergamot and cardamom in which added little mojito. "Alcohol-cocktail" theme is continued in the heart of the composition in the form of rum chord. It is complemented by notes of lavender and labdanum. Labdanum - this plant cistus resin incense, which occurs in the Mediterranean and Black Sea regions. Its pleasant smell of wood-amber fragrance reminiscent of incense. Face fragrance became an actor Alexander Skarsgard from Sweden, who presented the first perfume from the series.